The Fourth Principle of Economics, which N. Gregory Mankiw assures us is accepted by almost all economists is: People Respond To Incentives. This is obviously true, so it’s good that almost all economists agree. Neoliberals agree as well; it’s the basis of their understanding of human nature that people respond to money, and not much else. Here are the examples. When the price of apples goes up, people buy fewer apples, and “…apple orchard owners decide to hire more workers and harvest more apples.” Supply and demand are the direct result of incentives. Taxes can be used as incentives. If the gasoline tax goes up, people drive smaller cars, switch to public transport and buy hybrids. If the price goes high enough, they might even switch to electric cars. Incentives can have unintended consequences. Seat belt laws led to a higher number of accidents, and more accidents involving pedestrians. There are two longer examples, one on changes resulting from the gas price hikes from 2005 to 2008, and one on the way bus drivers are paid in Chile. It’s no doubt true that generally as prices rise, the amount purchased falls. It’s probably the case that the relationship isn’t continuous. People don’t watch the price of apples at all. When they are at the store or the market to buy they don’t say to themselves “prices are up a penny a pound, so I’ll just buy a bit less.” Instead, they compare apples to other fruits and even vegetables and as long as the prices seem about right, they buy. It takes a pretty good price jump foror people to notice the exact price per pound. On the other hand, maybe people think Fuji’s are about as good as Gala’s, so if one is cheaper, they buy them. Or if one set looks tastier for some reason, they buy those. The idea that the orchard owners harvest more or less depending on the price seems equally inadequate. Of course, once harvest season is over, there won’t be any more harvesting, so all decisions have to be made during the short season when the apples are at the proper stage of ripeness. If owners think the prices will be higher, maybe they will harvest more. Or, maybe they harvest all they can to protect the trees and the fields, and only sell if the price is right, and feed the rest to the cows. I don’t know enough about running an orchard to have an opinion, but apparently Mankiw does. The second example, gasoline taxes, supports the idea that demand can be manipulated by society for its own good. I don’t think that was Mankiw’s point though. We return to this idea in Principle 8. The discussion of seat belt changes shows typical short-term thinking. Assuming that the study Mankiw cites is accurate, and I note he describes it as controversial, in the short term, people acted in a more risky way after the passage of seat belt laws. Here’s a chart from the Statistical Abstract produced by the Census Bureau in 2012 with more recent statistics. Those statistics tell a different story. They say that the incentive created by one set of changes can be changed once the actual outcomes are known. Cars have become more and more safe, and with the recognition that some of the changes produced bad driving, people were able to find ways of making cars safer in ways that defeated the original incentives. 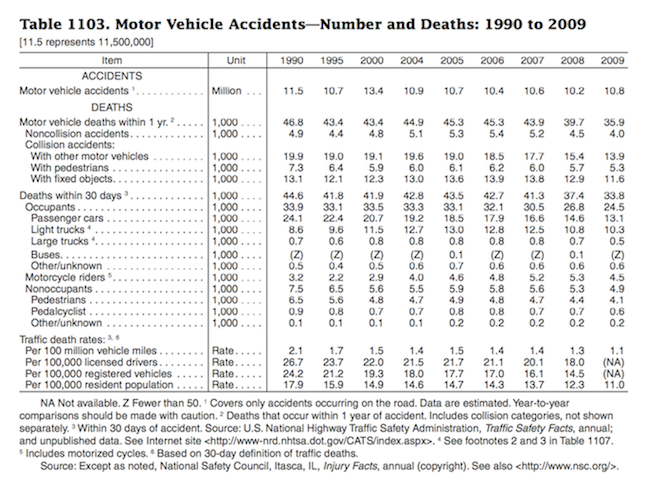 You’ll note that the deaths of pedestrians were down, too, but that doesn’t tell us much. The number of pedestrians overall may be down. Finally we have the bus driver example in Chile. It comes from Austan Goolsbee, and explains that drivers paid by the passenger work harder than drivers paid by the hour, including taking the shortest routes between two points when there is a lot of traffic. It doesn’t tell us anything about the response of bus riders who don’t get picked up, oe of other people trying to drive on the same streets as racing bus drivers. So, everyone agrees that people respond to incentives. The question is how people respond to incentives. Mankiw tells us that economists are social scientists, and their field is centered on understanding human behavior. If these examples are typical of economic thinking, the understanding of behavior is rudimentary and reductive. It’s fair to assume that models built on rudimentary and reductive ideas may produce strange and untrustworthy results. …the market is one way among others of objectifying the cultural-historical order, in this case on a large and impersonal scale by competitive pecuniary transactions. Material rationality is thus a representation in monetary terms of a subjacent set of meaningful relationships among persons and the objects of their existence. Utility values are the realizations of differential cultural values, while for their part cultural values are engaged in motivated symbolic schemes: the way evening gowns are distinguished from little daytime dresses, business suits from overalls, uniforms from mufti, silk from denim, and these are related to differences in status, class, place, occasions of use, gender, time of day, etc. The market is thus a medium and mediator of cultural order. And rather than an ontologically distinctive and structurally independent entity, the economy is here as elsewhere the material functioning of a cultural state of affairs. One might even say, as Stephen Gudeman (1986) argued some years ago, the economy is the pragmatic objectification of cosmology. Certainly, there are more values of things in heaven and earth than are dreamed of in your market philosophy. As you say, their “understanding of behavior is rudimentary and reductive”. Today , I swore off bananas and peaches because the beautiful fruits I purchased tasted like crap fruit with only the slightest of taste of the fruit they looked like! All from the effects of GMO! Now I will no longer pay good money for bad fruit! What’s going on here is not what Ed says in his first paragraph, its not the money loss, its being cheated, robbed of the good fruit for increased profits to a power syndicate that is stealing not just money but Our Reputation loss of ‘Buy the best buy American’. So that another billionaire makes it in the usa! Money sure is involved, but its the ‘cheating’! incentive (n.) early 15c., from Late Latin incentivum, noun use of neuter of Latin adjective incentivus “setting the tune” (in Late Latin “inciting”), from past participle stem of incinere “strike up,” from in- “in, into” (see in- (2)) + canere “sing” (see chant (v.)). Sense influenced by association with incendere “to kindle.” The adjective use, in reference to a system of rewards meant to encourage harder work, first attested 1943 in jargon of the U.S. war economy; as a noun, in this sense, from 1948. So we are using wartime jargon as an analytical term that turns out to be somewhat circular. Whatever encourages harder work encourages harder work. The neoliberal project is a Gradgrind regime of harder work. Mankiw knows nothing about agriculture. The key decisions for apples are made when the grower decides how many trees to plant. Or at least it used to be before corporations made those decisions in terms of how many apples from other countries to buy as part of its income stream for resale. The decision is about where to ship, not whether to ship. Apples ready for harvest are close to a sunk cost. Only in extreme price conditions do farmers or growers destroy their crops. The best fit to the model of incentives is the economic profession itself and its attachment to models that are preferred by the captains of industry regardless of their validation by the data. Most of the rest of the world doesn’t operate so tightly to an incentive model except where the economists have acolytes who think they should. Once again, it seems that the data presented are contrived examples and not a freewheeling exploration. Looking for where the regulators got it wrong is not a natural question unless one has an axe to grind. The more interesting question than driver use is manufacturer concern for the driver’s safety. The slow-walking of recall implementation by local dealers is a failure of proper cost accounting. Dealers experience recalls as a cost to them. If there is an incentive there, it is more political than economic. The manufacturer did not do due diligence sufficient to create externalized costs on the dealer and the dealer has little power to see that the manufacturer addresses quality issues. If the incentive model actually worked as advertised, events would move more quickly than they do to fix issues. Mankiw needs to think outside the Skinner box and talk to a behavioral psychologist. Jim Comey Finally Has a Dastardly Criminal Who Made His Texts Unavailable After Targeting OPM, Hackers Moved onto United?